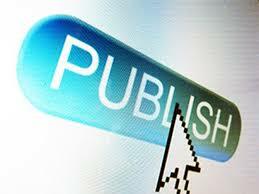 Now, what about self-publishing? Isn't that the biggest upheaval of all? Well, yes and no. One thing for sure (and contrary to common belief), self-pub is not new. It's as old as The Odyssey. Or The Canterbury Tales. Or Leviticus. Indeed, writers around the world published their own books for centuries, long before the invention of paper or printing. And definitely before the advent of what we now call traditional publishing. Dorrance Publishing (one of the leading self-pub outfits) was established in 1920. (Which means that they precede Random House by five years, and Simon & Schuster by four.) The very notion of a business that exists for the explicit purpose of printing and marketing the works of others -- and at its own expense -- is what’s new. You’ll find an informative article here. That said, of course, self-publishing has seen huge growth in recent years. Computers, ebooks, and print-on-demand technology have streamlined the business like never before. But that's on the production and retail side, where the author's direct participation typically matters little. None of it makes your writing better. Or your plot, or your grammar, or your platform. A few years back, The Guardian published a gushing article about author Amanda Hocking. It says that her unconventional self-pub strategy sold millions of books, and "changed publishing forever." Really? If this was true, we'd be hearing about yet another million-selling self-pub author every week. Among the Kindle Million Club, only she and John Locke got there without the help of a traditional publisher. Kudos to her for this, but nearly six years after this article appeared, no one new has accomplished this feat. Clearly, her experience does not portend a lasting new paradigm. The most profound effect that self-pub has had on the industry as a whole, is that it floods the market with books that are poorly written and received no professional guidance for editing or marketing. It gives false hope to legions of writers who truly believe they've beat the system by bypassing agents and publishers. They have heard anecdotes of fantastic success by Hocking and Locke and a few others, and assume that they will be next. So what’s the lesson here for the writer who desires to succeed in this business today? With this big-picture perspective in mind, the reality is clear: The more the industry changes, the more important the old-school fundamentals become. Yes! All day long. (Especially for self-pubs, because you don't have a built-in professional support system; everything depends on you.) In terms of what a writer needs to know and do to sell a boatload of books, little has changed. Today, this industry is more competitive than it has ever been. The rise of self-pub only makes it harder (not easier, as you've been told) for any one book or writer to stand out. You need to be better. You need to be distinctive. You need to be smarter. The average book buyer has more choices, but not more money to buy them. Every year, more and more publishers close themselves off to unsolicited submissions. Which only makes the role of the literary agent even more important. Contrary to what you’ve heard, their ranks are only growing; Writer’s Digest announces a new crop every week. Conversely, the ranks of acquisitions editors are smaller than they’ve been in decades. The pubs have figured out that they can get the same services from agents, so they only read submissions that come pre-screened and vetted by someone they know and trust. And of course, agents don’t get a paycheck or a desk or a pension plan. With this change, the pubs have vacated many acres’ worth of office space in Midtown Manhattan. There was a time, not so long ago, when novelists didn’t have to build platform in order to get noticed. But today, since the editors’ (and agents’) reading piles are taller than ever, they can afford to be pickier. Writers without it, need not apply. For all of the breathless excitement over self-publishing, the books typically sell in tiny numbers. Traditional publishing, despite all of its problems, still puts out better books and sells more of each title. The good news here, is that you can rise above the masses to get noticed. But it comes at a cost. Sure, you can self-pub your book in a day, and avoid all the bureaucracy. But then you will need to replace the services that a publisher would have provided. This is how you build a career as an author. Find a writers’ group, and hone your craft. Find a mentor, and invite the tough love. Attend a writers’ conference, and soak up the wisdom. Lose the attitude; you’re not entitled, and you're not a victim. Be humble, be teachable, make the connections you need. Revise, revise, revise. Then, when you succeed, you won’t just be a published author.